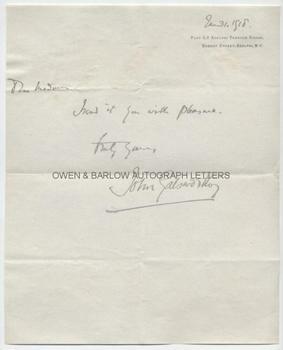 JOHN GALSWORTHY Autograph Note Signed. British (English) novelist. Author of 'The Forsyte Saga'. Winner of the Nobel Prize for literature in 1932. ANS. 1p. Flat A, 1 Adelphi Terrace House, Robert Street, Adelphi, WC. January 31st 1918. To "Dear Madam". 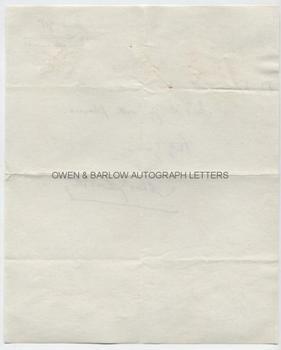 A brief letter, probably to someone who had requested his autograph. "I send it you with pleasure. Truly yours, John Galsworthy". 4to. Approx 10 x 8 inches. In fine condition with very slight mounting traces to verso.